5 String Banjo Chord Chart, G Tuning, g, D, G, B, D, includes the major, minor and seventh chord fingerings. Includes a banjo fret board with all of the notes marked. 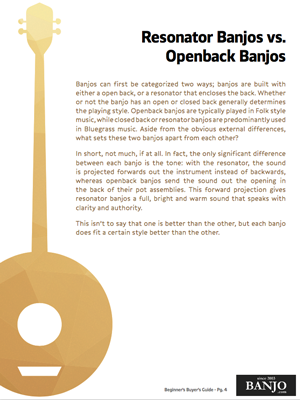 The Banjo is an essential instrument in everyones Bluegrass band and this chart will get you going. The 5 String Banjo G Tuning Chord chart is included in our book, Essential Chords for Guitar, Mandolin Ukulele and Banjo. The 1, 4, 5 refers to the chords that are played in a song and their relationship to each other. The key name will be the first chord, such as the key of A, the first chord is A, the next chord is 4 away or D and the final chord or the 5th chord is E. Often to give a song an edgy or blues sound you will play a seventh version of the chord, marked as E7. At a basic level for many songs that we know and love these are the chords that are played or the chords the song is based on. There are a million ways to play songs and tons of variations of how the chords are put together but knowing this basic information will really help give you a foundation for learning music. 5 String Banjo Key Chart with Chords for G Tuning. Includes the 7 keys, A, B, C, D, E, F, G with their 1, 4, 5, and 7th chord fingerings in first position. This chart make a great reference for any beginning player. The 1, 4, 5 chord relationship is standard in western music for rock, folk, country, and blues.